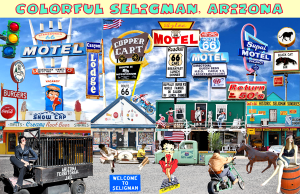 We’ve been down Route 66 in Arizona a couple of times, and Seligman is most definitely a must stop to experience the essence of America’s Mother Road. When pioneers along the Beale Wagon Road passed through this area in the mid-nineteenth century, it was known as Mint Valley. Later, when the Prescott & Central Arizona Railroad planned to connect the area to Prescott in 1886, the settlement was called Prescott Junction. Completing the tracks, the train had to run backwards to Prescott Junction because there wasn’t a turntable in Prescott. Before long, the Railroad went out of business, shutting down the junction. However, the Atchison, Topeka & Santa Fe Railroad took over the abandoned rail line, and the town changed its name to Seligman, in honor of the Seligman brothers, who helped finance the rail line south. 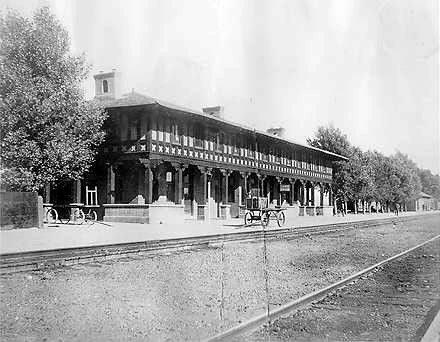 As railroad traffic increased, the Havasu Fred Harvey House was built. Opening in 1905, the hotel included 60,000 square feet, housing numerous hotel rooms, a large kitchen, a lunch room and a news stand. Abandoned by the railroad years ago, the building continued to stand for years; but, by 2007 it was in danger of being demolished. According to federal regulations, any occupied building must be a safe distance from active railroad tracks, which the building was not deemed to be. By this time, the building was owned by the Burlington Northern Santa Fe Railway, who made plans to demolish the building in 2008. Though locals and Route 66 preservationists actively worked to save the building, the “Save the Seligman Harvey House,” campaign lost the fight and the building was demolished in May, 2008. At the turn of the 20th century, Seligman was populated primarily by cowboys working the large ranches of the area. Along with these rough and ready men, came a piece of the Wild West, complete with shootouts on the streets. At this time the saloons and brothels outnumbered the churches three to one. Over the years, Seligman settled down; but, today, is still populated by people working at some of the state’s largest ranches. 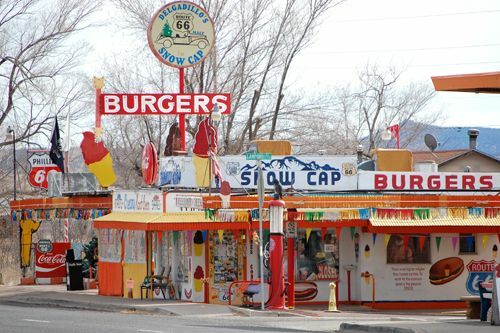 When Route 66 came through, Seligman accommodated the many travelers with numerous motor courts and services, bringing a substantial boost to the town’s economy. In the late 1970’s Seligman was bypassed by I-40, and then, in the mid 1980’s, the Santa Fe Railroad closed its operations in the city. Both were tremendous blows upon the small town and it soon came to a slow crawl. 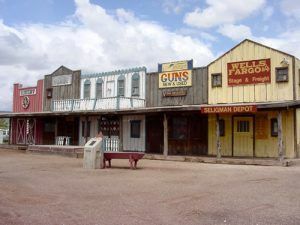 However, with the enthusiasm of Seligman’s residents, the town has been well preserved and the town has again become a popular destination for Route 66’ers. Today, a visit to this small city is a step back in time, where you will see an odd mixture of cattle ranching, truck drivers and Mother Road icons. 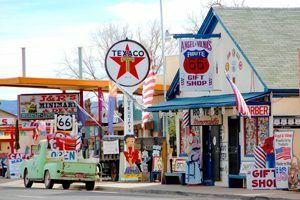 Be sure to stop by the Delgadillo’s Route 66 Gift Shop and Visitor’s Center and pick up a Walking Tour Guide to Historic Seligman, which will give you a glimpse the colorful history of the once thriving railroad town. Just east of the Vistor’s Center, is the “must see” Delgadillo’s Snow Cap Drive-In at 217 E. Route 66. A Mother Road landmark through the ages, you’ll enjoy not only great road food, but also a little humor that is always “served” up at the Snow Cap. There are numerous other interesting photo opportunities in Seligman, including the Rusty Bolt Souvenir and Gift Shop at 117 E. Route 66. Here, you’ll find some great souvenirs, along with a plethora of old cars and crazy mannequins to welcome you. At 123 E. Route 66 is the Return to the 50’s Museum and Gift Shop, which occupies an old gas station which closed in 1985. Also check out the Old West Town and The Roadkill Cafe a bit further down the highway. From Seligman, you will head west along the longest unbroken stretch of Route 66, where you can stop at Grand Canyon Caverns to see what the earth is like 21 stories below. From there, you’ll soon come upon the vintage towns of Peach Springs, Truxton, Valentine, and Hackberry. © Kathy Weiser/Legends of America, updated November, 2017. The Angel of Route 66 from Benjamin Hager on Vimeo.